Dr. Alan Lipp grew up in Brooklyn, New York. He attended the prestigious Honors Program in Medical Education at the University of Miami, graduating from medical school at the age of 22. He was elected into Alpha Omega Alpha Honor Medical Society and earned a perfect 4.0 GPA. He then completed his Internal Medicine Residency at the Mount Sinai Hospital in New York City and his Fellowship in Gastroenterology at Montefiore Medical Center/Albert Einstein College of Medicine. In 1997, he joined the practice now known as Klein, Geier, Lipp, M.D., L.L.P. Dr. Lipp is board certified in Internal Medicine and Gastroenterology. 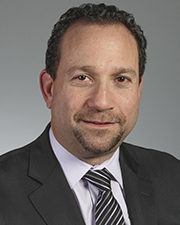 He is skilled in all facets of Gastroenterology and Hepatology and has special interests in colon cancer screening and prevention, inflammatory bowel diseases, gastroesophageal reflux disease, and hepatitis C. Dr. Lipp has given numerous teaching lectures to other physicians, as well as in the general community. He serves as Chairman of the Performance Improvement/Risk Management Committee at ECLI. Dr. Lipp has served as a Medical Advisor on the major motion pictures “Requiem For A Dream” and “Pi”. Dr. Lipp lives in Great Neck with his wife and three children.